This is a card of completion, hard labors reaping reward, promotion---harvest. An auspicious (and timely considering the upcoming autumn equinox) invitation to celebration and acknowledgment of achievement. 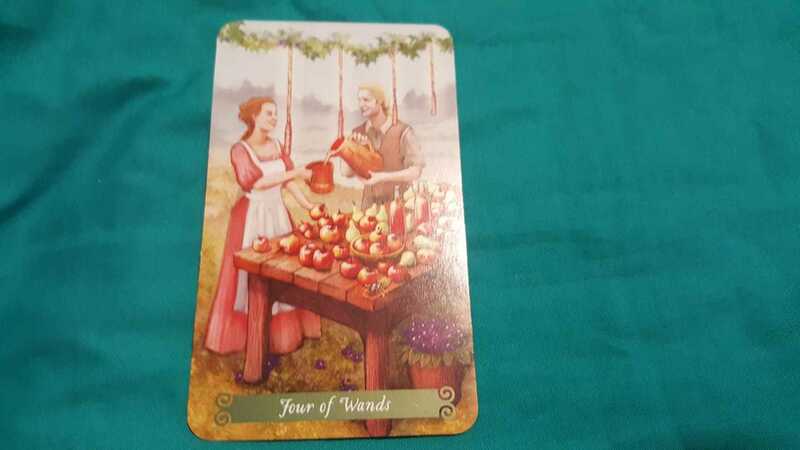 The Four of Wands also suggests this may be a good time to look toward relationship (starting a new one, strengthening one existing) because a firm foundation has been set. There is a sense of stability not had until now. Blue violets are a symbol of happiness and well being (bask in it) while a cicada offers the rhythm of home and success. Enjoy the party. You deserve it!